(CNN) - Alaska road crews are the envy of folks in the Lower 48 because of their quick repair of a road that was ripped apart by Friday's 7.0-magnitude earthquake. 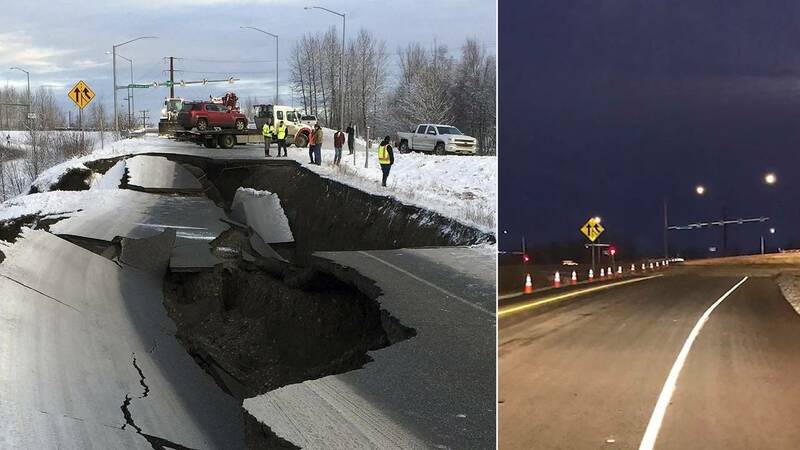 An off-ramp connecting International Airport Road and Minnesota Drive in Anchorage collapsed in the quake, creating a huge hole that made the unfortunate SUV that fell in look like a toy. Before and after photos shared on Facebook on Tuesday showed how quickly the repairs were completed. The jagged chucks of broken road are gone, the hole is filled, the road has been repaved and fresh lines have been painted. All that work took less than four days. The post went viral as people all over the country wondered why their cities and states can't fix the "blankety-blank-blank" potholes on their streets. The Alaska Department of Transportation and Public Facilities says it's harder to pave roads at this time of year because of the cold temperatures, but they can do it. Inspectors are checking out all 243 bridges that were affected by the earthquake, but haven't found any structural damage so far. The federal government released $5 million in emergency funds on Saturday to help get short-term repairs started as quickly as possible. There is still a lot of work to do in Alaska. Authorities have identified 50 locations on state-owned infrastructure that need repairs. In the meantime, they've asked Alaskans not to take selfies in the rubble.